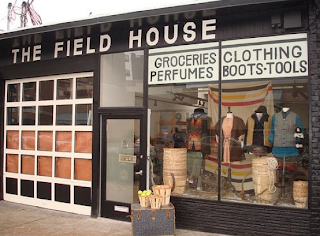 I can't wait to visit Blackbird’s newest store-- The Field House! Which is now open in the heart of Ballard, also known as my hood! The Field House is reminiscent of general stores that were once at the heart of rural towns across America. 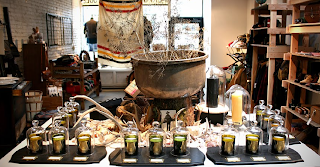 Its shelves are stocked with a wide variety of merchandise, including classic work wear, vintage goods, basic groceries and candies, flowers, and perfumes and candles. It captures the history, geography, and folklore of times past, when goods were less disposable and had more meaning, a time when people canned their own food and took a moment to converse with strangers. 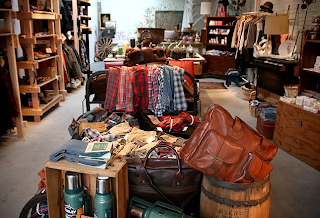 It is perhaps Blackbird's most personal store, as it is inspired by owner Nicole Miller’s eccentric Pacific Northwest family and her desire to get back to basics. “In a culture dominated by computers, The Field House is a refreshing invitation to slow down and connect with traditions that are lost and forgotten,” says Miller. In addition to merchandise, The Field House plans to have free weekly classes on lost skills such as "How to Debone a Chicken" or "Lawnmower Repair." The store will sell Christmas trees for the holidays and will serve a "cup-a-joe" from an insulated Stanley thermos. The Field House is an experimental pop-up shop. After three months, Blackbird will decide whether to make it a permanent part of the neighborhood (be sure to check it out!). It is located behind Blackbird at 5465 Leary Avenue NW in Ballard. The brands and items currently offered at The Field House include: RRL, Filson, Pendleton, Woolrich Woolen Mills, Woolrich John Rich & Bros, Alden, Billykirk, The Hill-side, Red Wing, April 77, Fjällräven and more!